Behind our House begins cycling and hiking paths in the nearby nature reserve Taubergießen, that with 1697 acres is one of the largest nature reserves in Baden-Württemberg. Numerous cycling and hiking paths lead on signed routes in the landscape of Europes probably last paradise. Here, endangered animals and plants still have found a home. On about 51 m ², we offer you a tasteful apartment, which was newly built in the year 2015. The holiday home is located in the basement, has a bedroom with double bed and wardrobe, which promises a pleasant night's sleep. In the living room with an open kitchen, you can relax in the evening on one of the two leather sofas for an evening of television. Our kitchen is equipped with fridge/freezer, sink, hob and oven. Here, you can prepare meals together. The dishes you can put in the the dishwasher after dinner. So you can relax easily after eating. The bathroom has a shower with WC. We hope to welcome you soon as a guest. We have won the Booking.com guest review with an average rating of 9.7 points in the year 2015. Our guests can also use our large garden and relax in the nature. For 6 nights and more you get discounts. Stay 14 days, pay only 13! Book 14 nights or more and you get one night free. 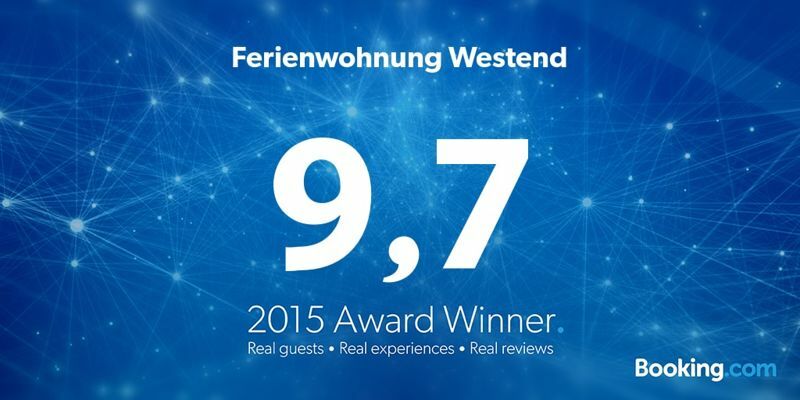 We have won the Booking.com guest review Award with an average rating of 9.7 points in the year 2015. We provide a high-speed Wi-Fi Internet access our guests free of charge. Perfect place to stay - at any time! Very nice host and a beautiful, modernly furnished apartment. Top facilities, very comfortable, super fast Internet, all quite straightforward - full recommendation!